Selections of Pop Art and works inspired by that movement from the Museum’s collection and on loan from private collectors are presented in the Windows Gallery in conjunction with the upcoming exhibition BLOW UP: Inflatable Contemporary Art. Artists include Andy Warhol, Roy Lichtenstein, James Rosenquist and more. 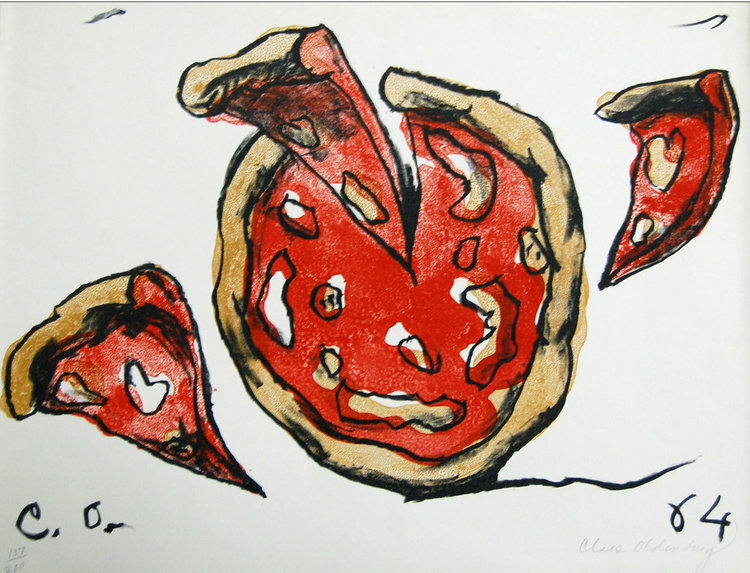 This etching of a Pizza is by Claes Oldenburg (b.1929). It is dated 1964, and was a gift of John Van Kirk in memory of Ruth H. Van Kirk. The Museum is fortunate to have letters written to Paul Whitener, HMA’s founder and first director, from artists and donors regarding early acquisitions to the Collection. Works of art by Wilford Seymour Conrow, Ella Richards (the first work by a woman artist acquired by HMA), Guy Carlton Wiggins and others are on display in the Whitener Gallery alongside the letters, offering an “insider” perspective to HMA’s early days of collecting. This exhibition paves the way into HMA’s 75th Anniversary celebration. Support provided by the Kenneth K. Millholland & Suzanne G. Millholland Endowment Fund, a component fund of the North Carolina Community Foundation.